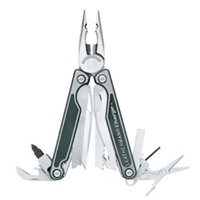 The name is synonymous with expertly engineered multipurpose tools. Since 1975, when Tim Leatherman designed the tool that bears his name, the company has focused on one thing...creating the world's highest quality multi-tool, American made pocket knives. When Tim first invented the tool he had trouble selling it. According to Tim, “The knife companies thought it was a tool, the tool companies thought it was a knife”. Now, thanks to Tim’s creativity and imagination, cranky cars are no longer a problem. Leaks can be fixed on the spot, and bottle caps are opened--even in the middle of the desert. The multi-tool has changed our activities, sports, and work; making lives easier, and even saving a few from time to time. Own a genuine Leatherman tool, and you'll understand.